Distinctive nose of black fruits. Elegant, complex and well balanced, with a hint of cocoa in the long finish. A balanced tannic structure and good spicy aromatic tones, which espouse well the typical leather and earthy tones of the Sangiovese. Complex, profound, with a lively acidity, long in the mouth with notes of cocoa aftertaste. 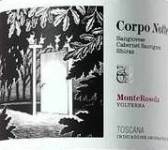 Sangiovese-based blend with international varietals (Cabernet and Syrah) accounting for around one third of the wine.